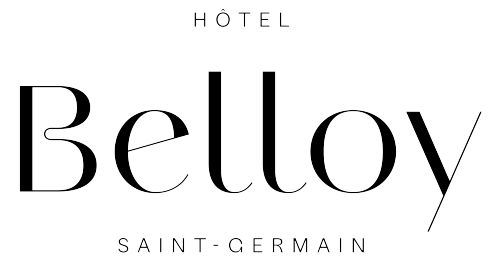 Located on the Left Bank, in the heart of Saint-Germain-des-Prés, the Hotel Belloy Saint Germain Paris is a magnificent 4-star boutique hotel for lovers of old Paris. Carefully renovated and decorated by interior designer Sandra Benhamou, the Hotel Belloy Saint-Germain Paris has 50 rooms and suites that offer contemporary comfort complete with literary and artistic touches evocative of French elegance. There are nods to literature everywhere, bringing a sense of serenity and well-being. A beautiful bar is located in the lobby of our boutique hotel. Choose from our selection of champagne and cocktails and enjoy intimate and convivial moments with your partner, friends or family. A library corner is also available for those who appreciate tranquillity and reflection. Throughout your stay, our staff is at your disposal, offering an attentive and personalised service. At the Hotel Belloy Saint-Germain Paris you are close to Notre-Dame Cathedral, the Louvre, the Pont des Arts, the Pantheon and the Orsay Museum. The hotel’s ideal location is convenient for browsing the wares of the many booksellers on the banks of the Seine and visiting the nearby publishing houses before heading off to relax on the terraces of the famous Café de Flore or the Deux Magots, situated a short walk away. For lovers of greenery and sport, the Jardin du Luxembourg is only 450m from the hotel. Wander around the Saint-Germain-des-Prés district, a favourite spot for filming in Paris. You can write your own scenario. Discover the rooms of the Hotel Belloy, decorated and furnished with authenticity and refinement, true to the spirit of the Saint-Germain-des-Prés district. Summer is just arount the corner, so enjoy a stay at the Belloy to discover the most beautiful city in the world. Save 25% off your room rate as welle as a complementary breakfast by booking on our official website. The Jardin du Luxembourg is located in the 6th arrondissement, just a few minutes away from Hotel Belloy Saint-Germain.